Still being just a little too scared to wade into the whole Toyota debacle, let me instead shift my attention to one of the company’s Japanese competitors – one that seems to have retained its good reputation in recent months. Nissan may not have shared Toyota’s (in retrospect) slightly audacious attempts to corner the American truck market, but the trucks it does produce are solid, unique and stylish in a way the domestics still can’t replicate. 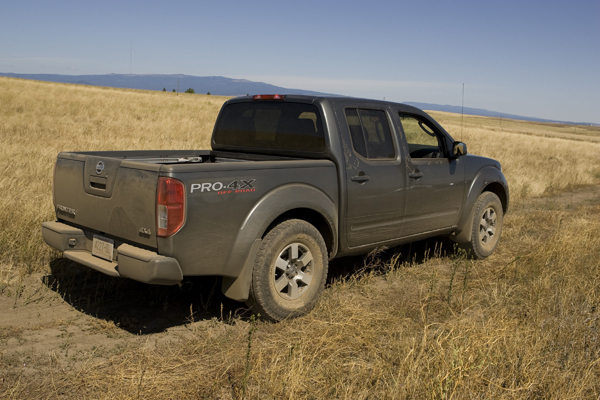 The Nissan Frontier, the company’s midsize pickup offering, turns into a formidable off-road machine when outfitted in the optional Pro4X guise, complete with Bilstein shocks, skid plates, hill descent control and a four-wheel limited slip setup. Go for the whole package, including a cab-mounted roof rack system, a Utilitrack tiedown system, sprayed-in bedliner and custom 16-inch offroad wheels and gargantuan, 265/75 trail tires, and the smallish truck suddenly gets a whole load of California-styled macho. Add it all up, complete with Pro4X-specific carpets, seats and red accent trim, and you get a vehicle that will either get the thumbs up from the bro crowd or just a bit of snarky laughter from those Jeep dudes hitting the trail. Should you be the kind of cat who actually beats the living hell out of your (as equipped) $33,000 new truck, you’ve opted for a well-appointed way to do so. My test ride featured a more-than-adequate 261-horsepower 4.0-liter V6 with in-cabin, three-mode electronic 4×4 switching, a locking rear differential and … the earnest ability to get about 19 miles a gallon on the highway. The jacked-up machine’s resulting ride is a little bouncy but actually not too bad considering the rubber and the ride height. Steering felt a tad strong-armed but … it’s a truck, and one with big tires, so you’d learn to deal with that. The 59-inch-long bed (this was the shortbed crew cab model) might seem like an oversized kiddie pool but the flop-down bed extender and the rigid tiedown system looks like it might help accommodate a small dirt bike for your trip down to Baja. The classy part is the leather-surfaced interior you get to roll along in while sucking up the sand dunes and such. The cabin is outfitted in pretty standard Nissan truck and SUV finishings, though I found that dropping the rear seat for storage (and to free up the rear sightlines from some large, fixed headrests) did expose some big, noisy gaps in the rear cabin sound deadening. More civilized touches include Bluetooth connectivity and a ridiculously powerful Rockford Fosgate stereo – the under-the-rear-seat-mounted subwoofer makes those noisy gaps disappear and will also deafen anyone who rides with you. The rear seat ain’t enormous but it’s full-sized and even features a fold-down center armrest. Frontier’s whole look got a facelift in 2009 and the improved grill and headlight design is quite attractive. Given that the “other guys” come to the smaller pickup table with some outdated options – the million-year-old Ford Ranger, the Dodge Dakota and the Chevy Colorado – Nissan’s version seems pretty cool by comparison. The Toyota Tacoma is also a nice option but … best not to mention that brand for a few more weeks.